Over the last 12 months I have been lucky enough to have the opportunity to read, reflect and write about evidence-based practice and education. The more and more I have read about the application of evidence-based practice the more it has become that there are a number of common misconceptions about evidence-informed practice in circulation. In my view it’s important to eliminate these misconceptions for three reasons; first, these misconceptions prevent practitioners making the most of the potential of evidence-based practice to improve outcomes for pupils; second, by conflating evidence-based practice with research, teachers are being mistakenly encouraged to be ‘researchers’ rather than ‘evidence-based practitioners seeking to improve their practice; third, not making good use of evidence-based practice can lead to resources being wasted. But before looking in more detail at the most common misconceptions associated with evidence-based practice it seems appropriate to define the term ‘evidence-based practice. To help with this task I will used the definition of evidence-based practice put forward by Barends, Rousseau and Briner (2014). So what are some of the most common misconceptions associated with evidence-based practice within education? Misconception 1 – Evidence-based practice ignores the expertise and knowledge of teachers and head-teachers. As Barends et al state (2104) clearly state this misconception is contradicted by the definition of evidence-based practice. 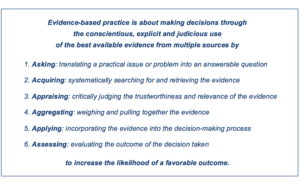 Evidence-based practice is about practitioners combining their experience with other sources of evidence in order to make decisions which they hope will bring about better outcomes. This does not mean that research evidence of ‘what-works’ automatically overrides the practitioner’s experience, although that expertise needs to be both reliable and valid. In other words, practitioners need to be aware of the limitations of their own experience in the decision-making process, particularly if that experience is not relevant to the task at hand. Misconception 2 Evidence-informed practice is the same as research-informed practice. As can be seen from the definition, research-informed practice is a subset of evidence-based practice. Evidence-based practice involves drawing upon evidence from a range of sources be it ‘academic research’, practitioner experience, organisational/school data and the views of stakeholders. Indeed, there are real risks associated with the term research-informed practice as it creates the impression that research evidence is more valuable than other forms of evidence. In doing so, it helps creates the conditions whereby critics of can argue that research should not be used to tell teachers what to do. Evidence-based practice is not about attempting to create new and generalizable knowledge through the conduct of research. Rather EBP is about making decisions using the best available current evidence in order to improve pupil outcomes. That does not mean that teachers do not engage in some form of inquiry or evaluation of their impact on pupil outcomes, but the emphasis is on both the improvement of the teacher’s capacity and capability and better pupil outcomes. In other words, EBP is here to help teachers improve, rather than prove. That said, if teachers are to improve as EBP then a necessary but not sufficient condition will be for teachers to be research literate. This discussion suggests a number of implications for HEIs. First, there’s a significant body of academic literature and research on evidence-based practice which appears not to be known to many members of the ‘educational academy’ and is resulting in ill-informed discussion and debate about the merits of evidence-based practice. Second, one of the roles HEIs should to help provide teachers with both conceptual clarity and accurate, accessible and relevant summaries of the relevant literature. Third, a major role for HEIs should be about helping teachers acquire the knowledge and skills to be research literate, and that is not the same as training teachers as researchers. And finally, if HEIS want to help teachers become better evidence-informed practitioners – please open your libraries to local teachers, and let them access the research evidence. This definition is partly adapted from the Sicily statement of evidence-based practice: Dawes, M., Summerskill, W., Glasziou, P., Cartabellotta, A., Martin, J., Hopayian, K., Porzsolt, F., Burls, A., Osborne, J. (2005). Sicily statement on evidence-based practice. BMC Medical Education, Vol. 5 (1). 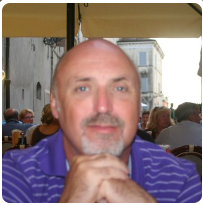 Dr Gary Jones, @DrGaryJones, worked in post-compulsory education for over 25 years and is now an independent researcher, consultant and blogger (http://evidencebasededucationalleadership.blogspot.co.uk). Gary has a doctorate in educational management from the University of Bristol and is interested in developing effective evidence-informed practice. In 2014 Gary led, in conjunction with Professor Bill Lucas of the Centre for Real-World Learning based at Winchester University, a college-wide action research project on the implementation of a theory of vocational pedagogy. In 2015 Gary has presented at ResearchED Sydney, Cambridge, New York, Glasgow and UKFEchat London. Gary is currently supporting schools as part of the Expansive Education Network and is acting as critical friend the Associate Educational Fellowship Programme in Bedford, England.